Your favorite personalized horse memorial ornament, offered now in its gorgeous raw steel finish! 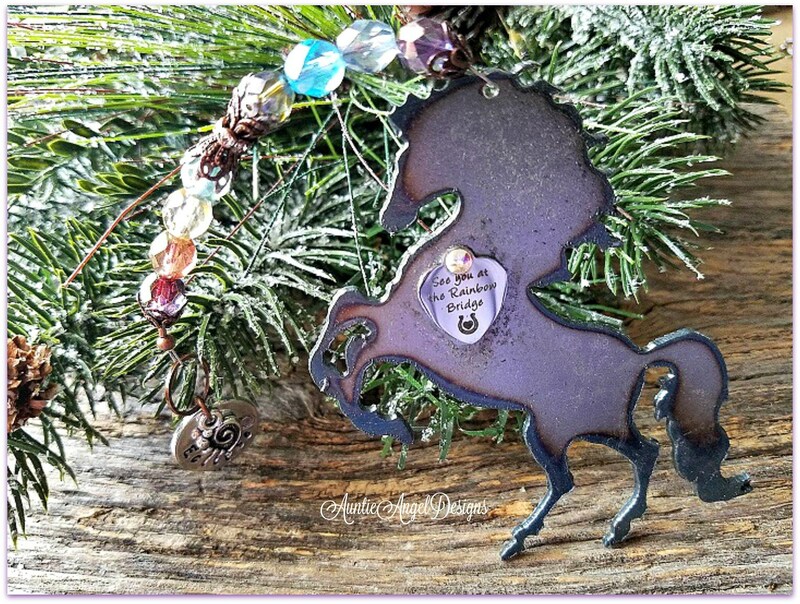 The "Rainbow Bridge Horse Memorial Ornament" is a unique and exclusive horse sympathy gift by Auntie Angel Designs for the Christmas holidays and beyond. 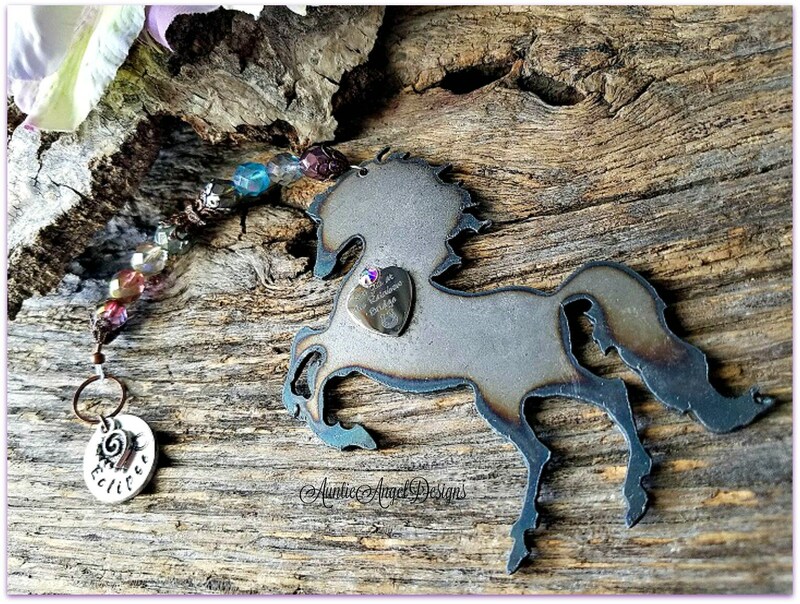 This gorgeous, metal Rainbow Bridge-inspired piece is meant to remind you always of your precious horse at the Rainbow Bridge, knowing one day you will be reunited. Each 16-gauge metal horse cutout is 3.75" wide at its widest point and 2-1/2" tall, with the thickness of about a quarter. 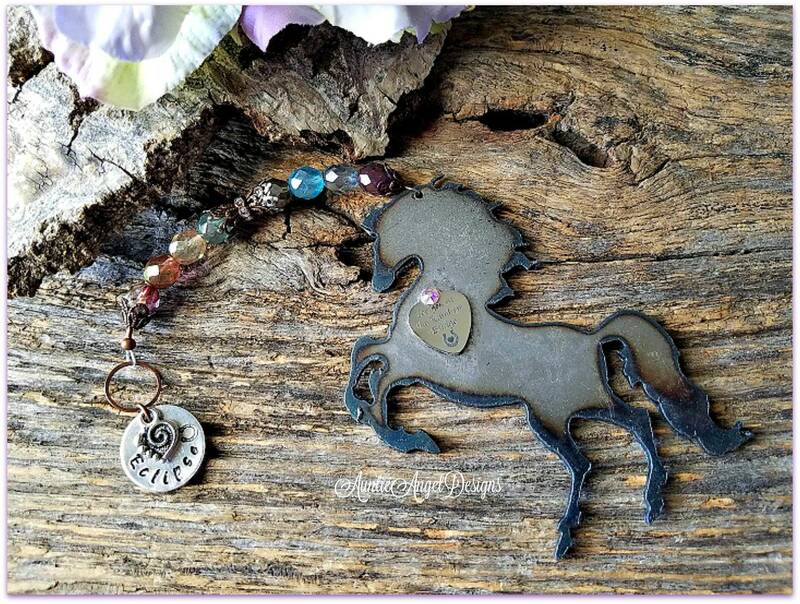 The horse cutout dangles from a strand of crystal-faced beads in colors of the rainbow. The beads are in a luster finish and beautifully capture the light, like next to a window. Each piece is strung on flexible wire and finished with fine filigree antiqued copper bead caps and decorative spacer beads and a copper ring. Our exclusive stainless steel heart charm reads "See you at the Rainbow Bridge" and is layered with a genuine Swarovski crystal. This ornament's total beaded length including the metal horse is approximately 5-1/2" long. 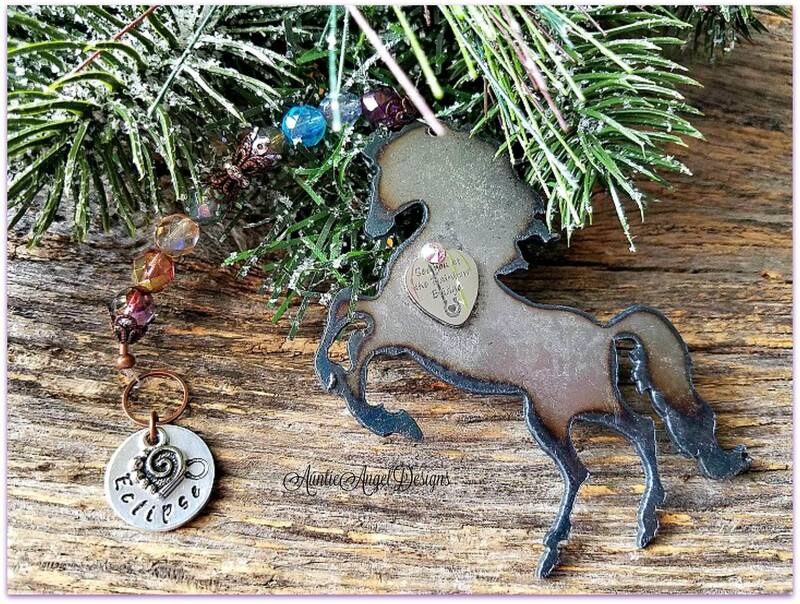 Add your horse ornament as a wind-catcher focal or to a memorial wreath or dangle this piece from a place of your choosing year long and transfer to a Christmas tree during the holidays, if desired. Each metal cutout has been triple clear-coated to preserve the richness of the steel coloring and burn pattern from the saw, which varies from ornament to ornament. Some ornaments ARE more rustic and have more slag on the back than others. Please allow for slight variations in the hand-cut metal. 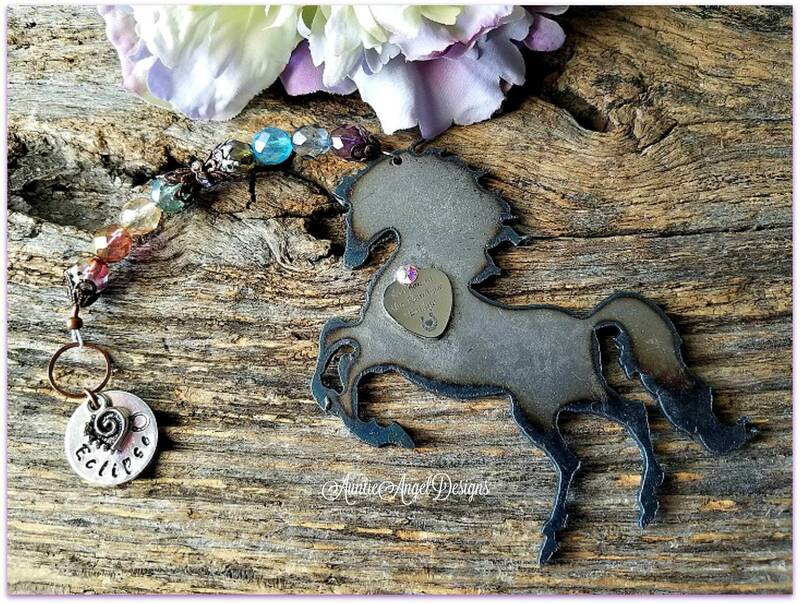 ***** For an additional charge, I can personalize this piece with the horse's name stamped on an aluminum disk with an independent silver-plated swirl heart charm that is attached at the top copper ring (above the beadwork). Only a name can be stamped and on only one side of the disk. Note: The aluminum disk is a nice complement to the steel ornament. As each letter is hand-stamped by me, letter by letter, alignment and spacing may, and most likely will be, slightly off, which is the beauty of a custom hand-stamped piece. The name will NOT look like it has been engraved by a machine. NOTE: "Ornament only" means your ornament will not be personalized with a stamped name disk and swirl heart charm. You will receive ONE ornament, lovingly gift-boxed with ribbon. If I am sending this gift for you, please fill out the free Etsy gift card section during the checkout process. 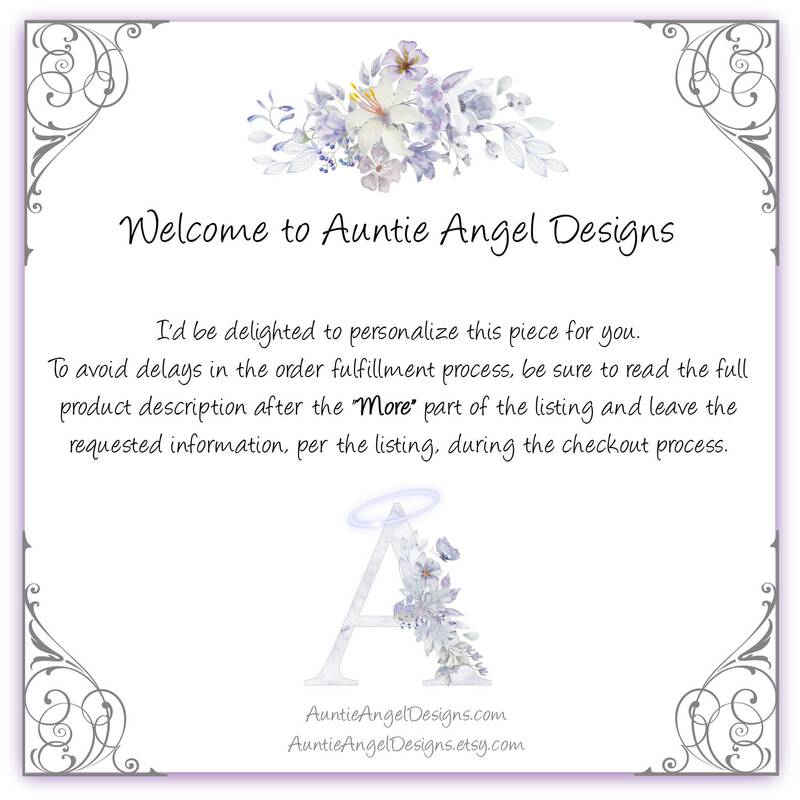 If the gift is being shipped directly to you for "you to give to your friend or loved one, be sure to click that this is a gift during the checkout process and I will include a blank gift enclosure card and envelope. Please visit my Etsy sister shop at www.inlovingmemoryofyou.etsy.com for more memorial jewelry and gifts.